The world - my world - feels all sorts of crazy and overwhelming and unapproachable at the moment. Which, in turn, makes me crazy and overwhelmed and unapproachable. I blamed it on the moon and Capricorn and the feelings that come when the astrological forces are strong, but in all actuality it had nothing to do with the supermoon in Capricorn - my world has been chaotic because I've done nothing to make it otherwise. So when I woke up this morning at 4AM, unable to fall back asleep with a racing mind and pounding heart - and too burnt out to continue my ritualistic morning reading of Grist, Mother Jones, and NPR Environment - I walked out to the bookshelf and grabbed the first thing that caught my eye, which happened to be the bright orange binding of Eat, Pray, Love. I picked it up, laid on the couch, and before I knew it, it was 7AM and I was nearly finished with the most quote-worthy piece of literature I think I've ever read. 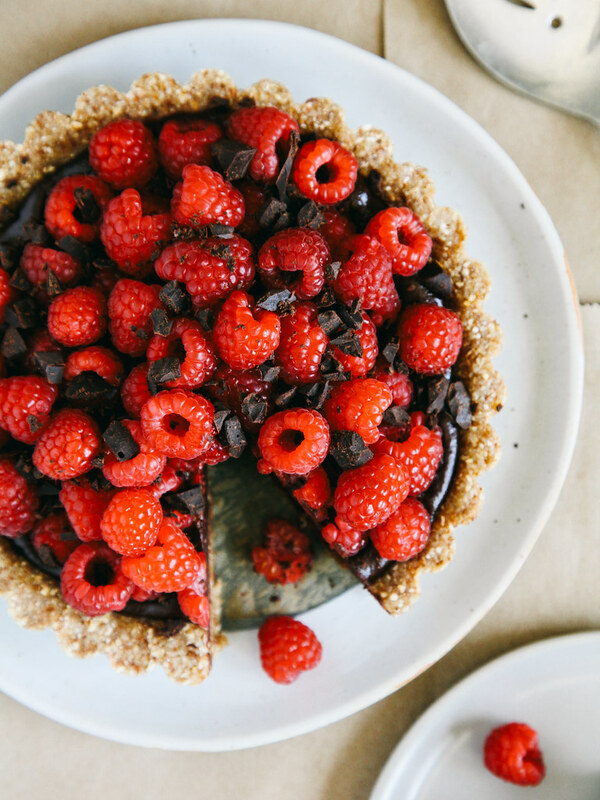 Aside from this chocolate-raspberry tart and a giveaway, today I have a quote for you. One I think will serve us well as we step into a new week. I've said it before, but I think one of the biggest misconceptions running rampant through our culture is this idea that happiness is a fortuity; that it's something we stumble upon if we're in the right place at the right time or if we wake up on the right side of the bed. I've also said this before: I think we're fools to think this way. And I think maybe Elizabeth Gilbert thinks we are, too. If you haven't gotten your hands on the beautiful cookbook that is The Vibrant Table, now is your chance because Anya's publisher was kind enough to send me a second copy to giveaway to my readers. Although the book is not vegan, a majority of the recipes are and the ones that are not can easily be converted (honey to maple syrup, eggs to flax eggs, etc.). 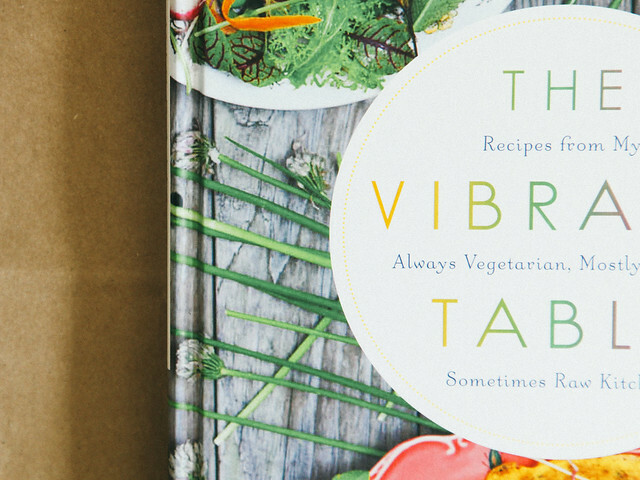 To enter to win a copy of The Vibrant Table, leave a comment telling me your favorite summer treat and why you love it so much. Because I'm feeling generous, this giveaway is open to the whole damn world, through the end of the week. Giveaway is closed and winner has been notified. Congrats, Erin! 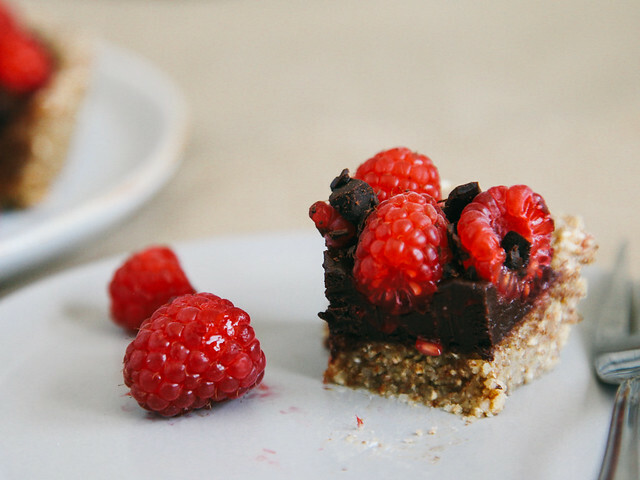 Notes: Anya's original raw chocolate recipe calls for agave nectar and maca powder, but I didn't have either on hand so I substituted maple syrup and lucuma powder. As a result of the maple syrup, the chocolate recipe isn't 'raw'. 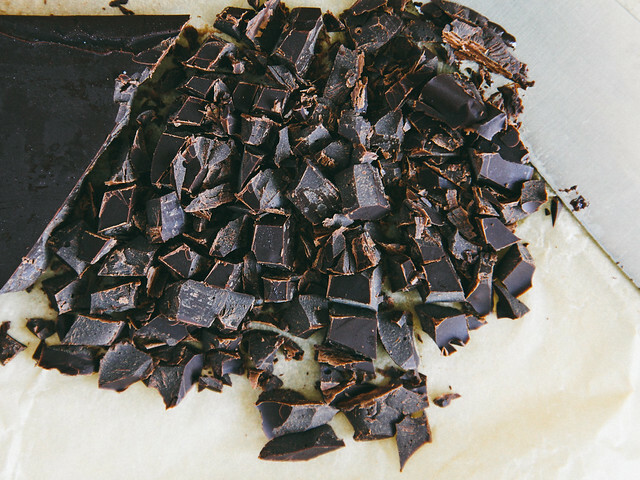 The mesquite is pretty crucial to give the chocolate it's deep flavor, but if you don't have any just substitute equal parts of cacao powder - no big! I used a small loaf pan lined with parchment paper to stand in as a chocolate mold, but if you have a mold I recommend using that as the parchment method doesn't exactly make for the most photogenic bar or chocolate. 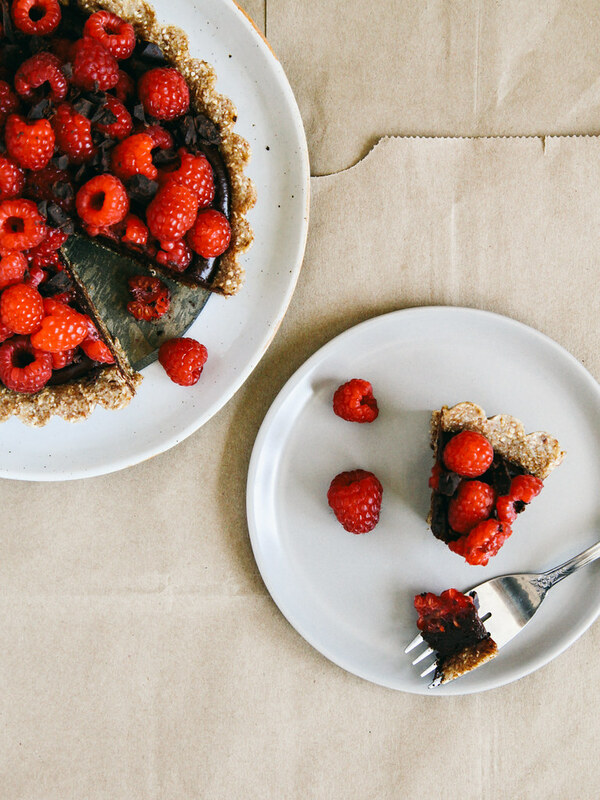 If you're not into the almond + oat based tart crust, this recipe would be delicious with a no-bake sweet biscuit or graham crust. 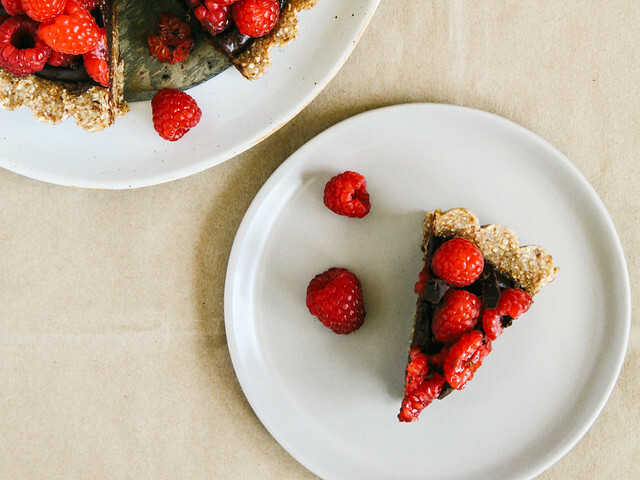 And for those who have an aversion to nuts, use 2 cups of rolled oats in the crust and increase the non-dairy milk to 1/4 cup. Line the bottom of an 8-9" tart pan with parchment paper and spray with oil; set aside. 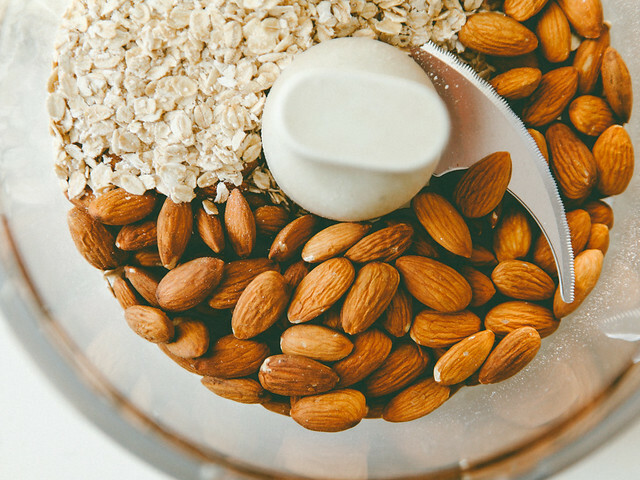 In a food processor fitted with the S blade, blend the oats, almonds, and salt into a super fine meal. Add the dates and blend just until combined. Add the non-dairy milk (two tablespoons first) and blend until the dough is crumbly but sticks together when pressed between your fingers. If it doesn't work after two tablespoons, add the third. I do not recommend adding a fourth or else you'll get a really tough dough. Once you've reached the desired consistency, press dough into the prepared tart pan and set aside (do not refrigerate just yet). 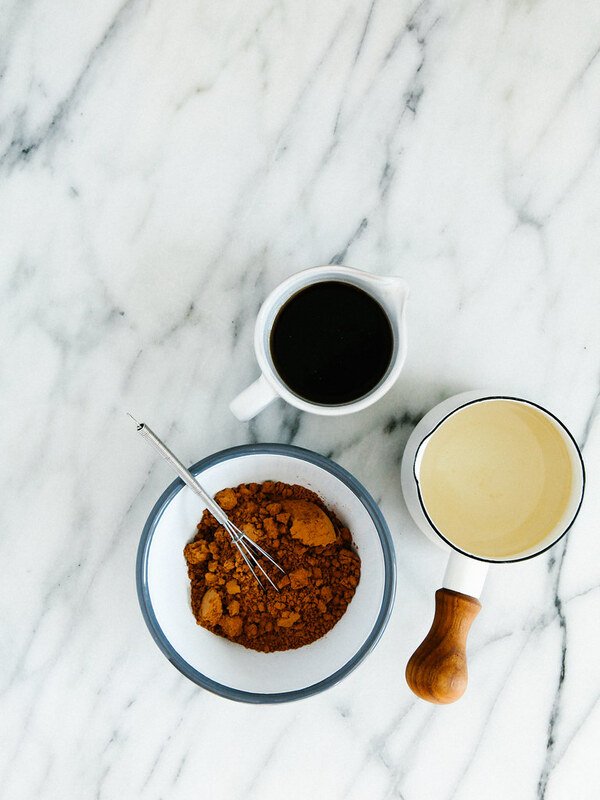 In a small bowl, stir together the cacao powder and one tablespoon of the coconut oil. Stir until all clumps are dissolved then stir in the maple syrup. 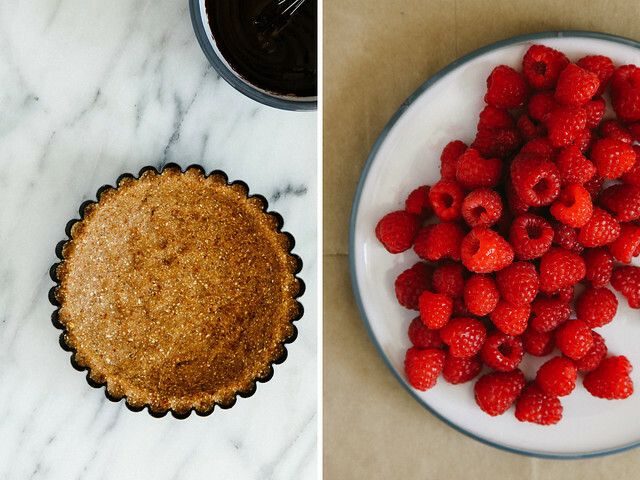 Once combined, whisk in remaining coconut oil and pour directly into tart shell. 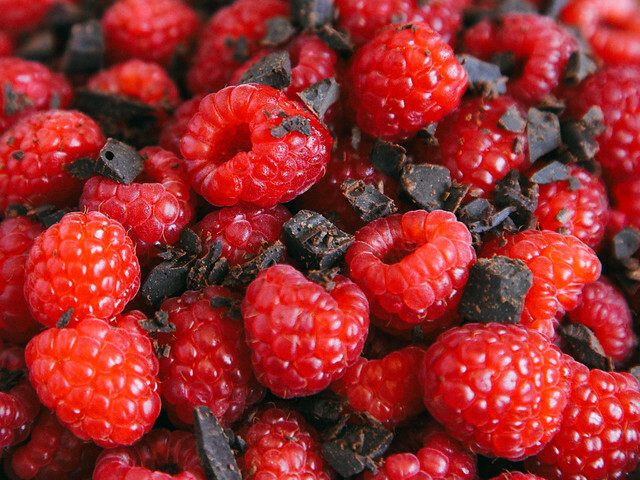 Top with raspberries and Anya's homemade chocolate (recipe follows) then transfer to the refrigerator to set for at least an hour. 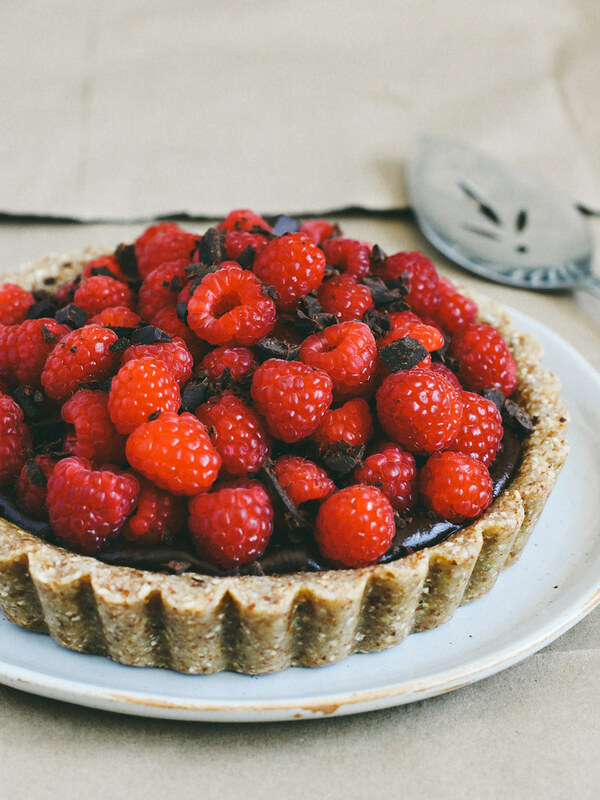 Tart will keep refrigerated in an air tight container for up to one week, or in the freezer for up to six. Line a small loaf pan with parchment paper; set aside. In a double boiler over medium heat, melt the cacao butter until liquid then stir in the maple syrup and remove from heat. Sift in the cacao powder, mesquite powder, and lucuma powder and whisk until smooth. Pour into prepared mold and freeze until set.